Blues in the Wind. 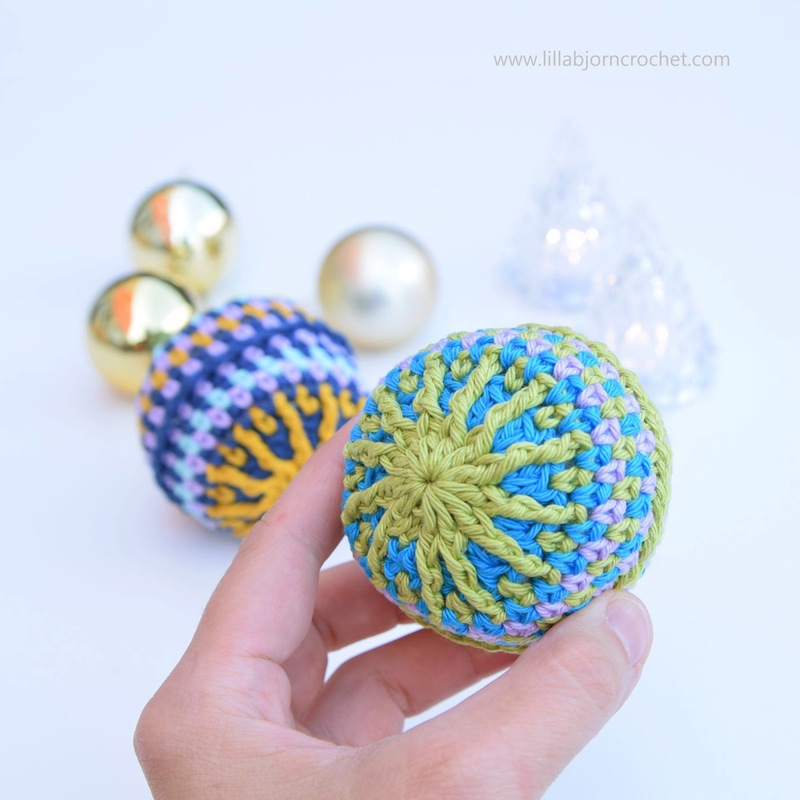 One crochet pattern for a pillow, blanket, coaster and bauble! Pillows are something I truly enjoy to make. I am not sure how many pillows I have at home already (and I’m afraid to count them), but I believe they can never be enough. With just one new pillow on your sofa or chair you can give the room a different accent, and even a whole new look. 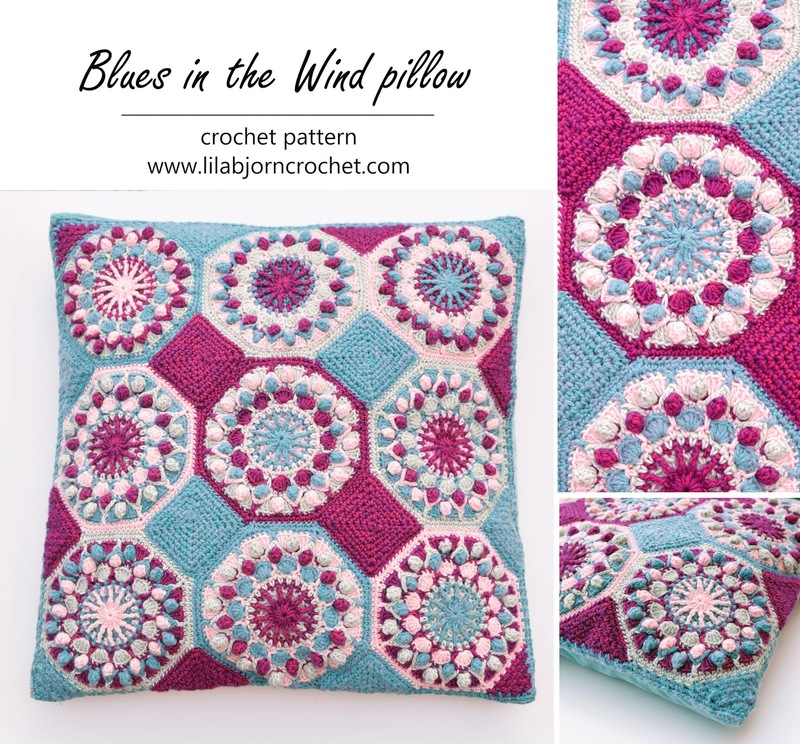 And today I would like to show you my new (pillow) design – Blues in the Wind. Blues in the Wind pattern was originally published in May issue, 2018, of Happpily Hooked Magazine. And now it can be released as a stand-alone design. You can find it both on Ravelry HERE and Etsy HERE, and you can save 20% over this weekend (through Monday, September 24th, 2018). You don’t have to apply any codes, as discount was applied already and the price you see is final. Blues in the Wind pattern is a very special one. :) And in a few paragraphs below I will explain you why. I usually use square shape for my pillow decorations, but this time I decided to use octagons instead. Joined with small squares and triangles, they get the look of true mosaic tiles you can see on the floors in old buildings. The pattern uses only 4 colors, but each octagon is different, because colors are combined in a different order. I chose River Washed yarn by Scheepjes (reviewed HERE) together with Stone Washed yarn for my pillow, and it has added new play of colors, as each new skein carries two different shades in itself. But the pillow will look great with any yarn in solid contrasting shades. To save yarn (and my precious time) I only created front square decoration and sewed it onto ready fabric pillowcase. I always use this method, as in my opinion the pillow better keeps its shape, fabric pillowcase has a zip or other closure already (so no need to think of any, and it’s very easy to wash it). And finally – the time to make a pillow becomes twice shorter! Nice solution if you are in a hurry and need to complete gifts asap, for example. 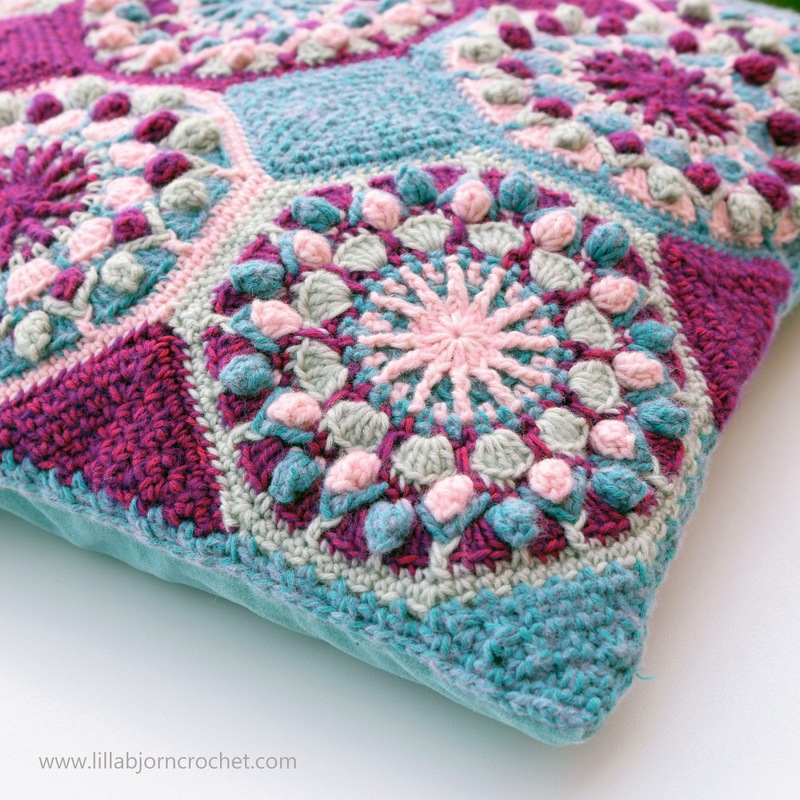 If you are not sure how to attach crocheted piece to a fabric pillowcase, please, see my video-tutorial HERE. Blues in the Wind pattern is also special because it can be used for blankets! 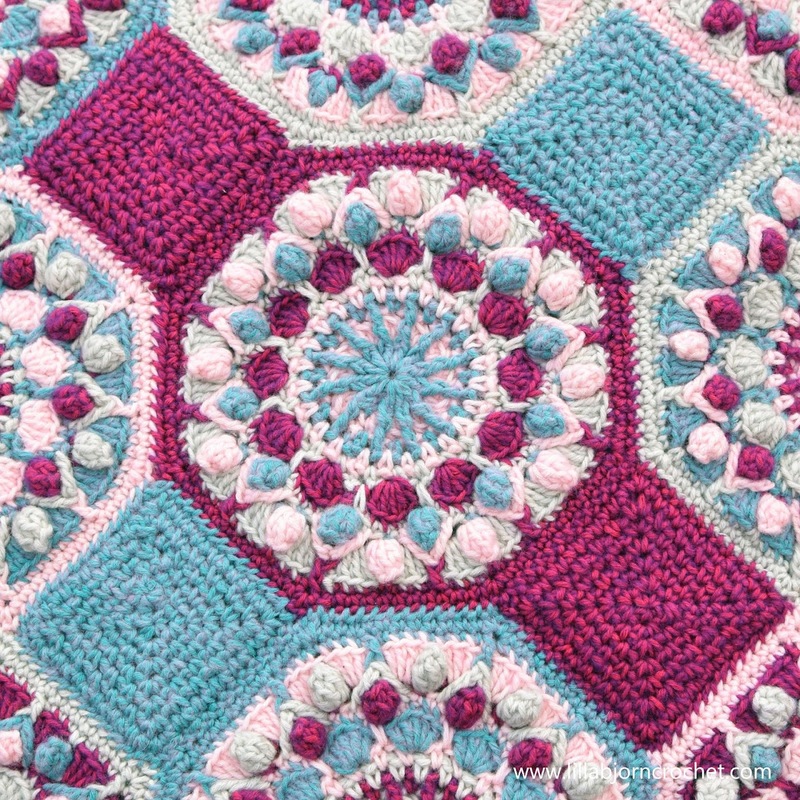 Octagons are textured but “airy” in a way, and with soft yarn the crocheted fabric will drape very well. If you are in a mood of making new interior accessories for your home, you can make all designs match each other. And that’s with just one pattern! :) As mentioned, you can make a pillow and a blanket. 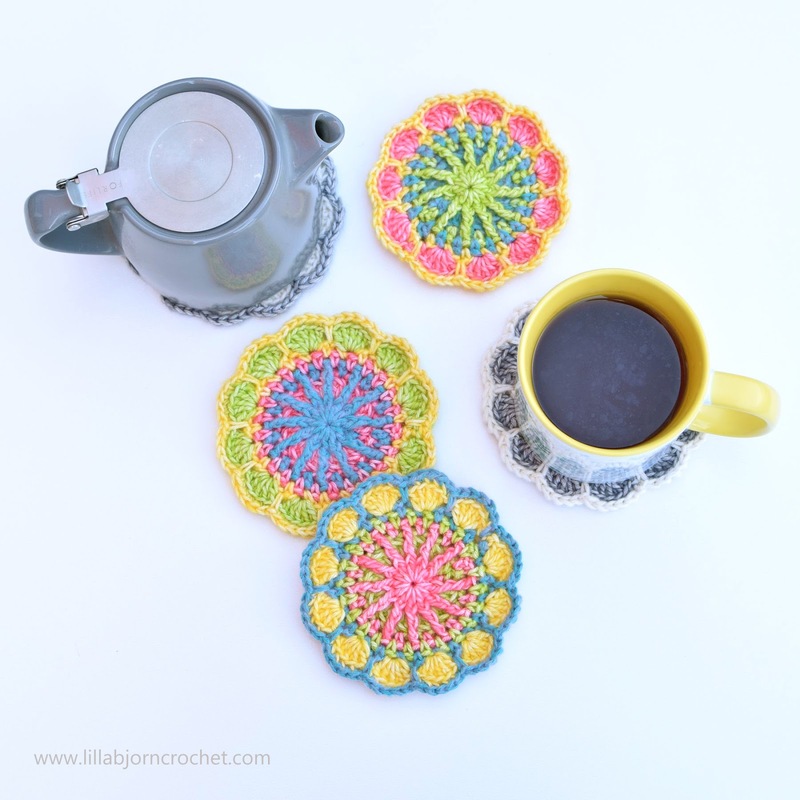 And using Blues in the Wind pattern you can also create small and cute coasters for your coffee table. Just stop after Round 7 – and here they are! Simple and quick, great for using leftovers. 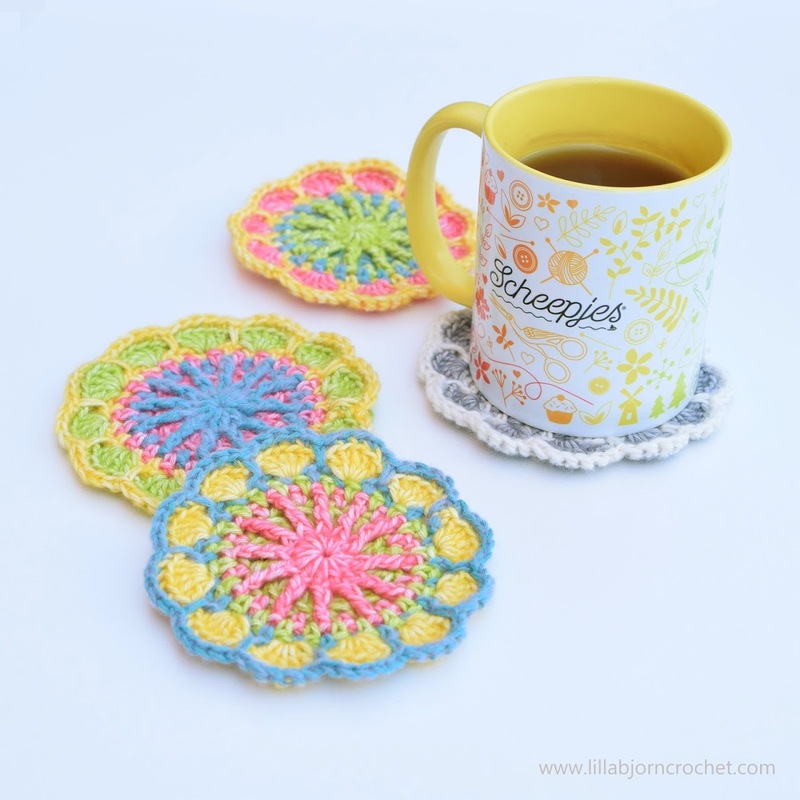 And with only 4 colors you can create 9 different coasters! I’ve been playing with Blues in the Wind pattern to see what else I can make with it. And suddenly I got an idea of small baubles!! You should only complete 4 rounds as per Blues in the Wind pattern, and then repeat Round 4 four more times changing color on every new round. You will get a half sphere. Then you should make another one, and join them together by repeating Round 4 again, but inserting the hook into corresponding spaces on both half spheres. When you are almost done, stuff your bauble and complete joining round. Finish with slip stitch in first single crochet stitch and fasten off. That’s it! 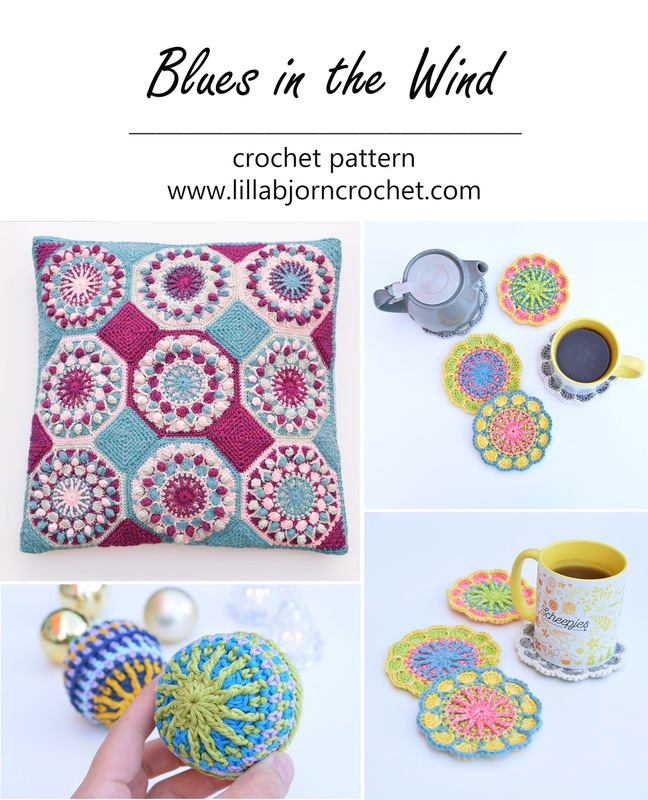 To summarize, you can use Blues in the Wind pattern to make a pillow, a blanket, coasters and baubles. And just to remind the pattern is on SALE right now both on Ravelry HERE and Etsy HERE. I love this design,very versatile. I'm looking forward to working on a few projects with. You've given me IDEAS!!!! Beautiful, as all of your designs are!! !